(1030) It is the flow of thermal energy. That is the standard definition. If someone knows that it really means nothing. After all, in our atmosphere of which we can't measure the temperature according to Into The Night and IBDaMann, we simply can't know if the Stefan-Boltzmann constant means anything. Heat does have various definitions. One definition is based on the volume of gases. This might be because if we have one lone molecule, it will release no heat. But if we have 2 molecules or elements, then one can release heat content while the other absorbs it. This gets into atomic physics. Chlorine which is Cl on the periodic elemental table is a gas. If "heat" or what is commonly referred to as background electromagnetic energy is passed from one element to the other, then background electromagnetic energy is heat. But what if we get into plasma physics? That's actually considered the 5th state of matter. That's high energy particle physics. Highly excited ions. Are they heat? Those would be the 2 most basic forms in which heat could be considered. Maybe Into The Night or IBDaMnann could clarify their comments about what a flow of heat is in specific terms. I know I'd like to understand what they mean. Instead of them demeaning others maybe they can offer a clear and concise definition of what heat is? Is that too much to ask? We are all over 16, right? At least I hope we are. For all I know ITN and IBDaMann still live at home with their parents. IBDaMann, yours or ITN's standard reply is meaningless. The only reason an element or a molecule releases heat is because it interacts with something else. Even with the Stefan-Boltzmann constant, it shows an interaction. Why does a black body have energy to emit? Neither you nor ITN can answer that question. I think the real question is what you and ITN have against people. From what both of you post it would suggest that you're afraid. You both need someone to lash out at. Why are the 2 of you afraid? The only reason for my last comment is because when either of you attack someone, it has nothing to do with anything. The 2 of you are simply attacking someone who posted something. James___ wrote: This might be because if we have one lone molecule, it will release no heat. One lone molecule cannot conduct, no. It needs contact with another molecule to conduct thermal energy. One lone molecule, however, will still emit thermal radiation (and lose thermal energy) per Stefan-Boltzmann (and Planck's). James___ wrote: But if we have 2 molecules or elements, then one can release heat content while the other absorbs it. Only a scientifically illiterate moron would refer to "heat content" and think he's talking science. I hope you aren't trying to impress anyone. James___ wrote: This gets into atomic physics. We generally call this "chemistry." I hope I'm not the first person to tell you this. James___ wrote: But what if we get into plasma physics? That's actually considered the 5th state of matter. Well, it's one of the five ... if you accept five states of matter ... but they aren't assigned specific numbers. You are free to assign the positions as you see fit. James___ wrote: That's high energy particle physics. Highly excited ions. Are they heat? In the Global Warming theology, "heat" means whatever it needs to mean at any given moment.&nbsp; The term is employed by Global Warming believers to shift semantic goalposts as necessary. It's meaning can shift fluidly between "temperature," "increase in temperature," "thermal energy," "flow of thermal energy," "convection," "absorption of electromagnetic radiation," "energy," "conduction," "infrared," "plasma," "work," "power," "radioactivity," "electrical energy" and others as convenient. James___ wrote: Maybe Into The Night or IBDaMnann could clarify their comments about what a flow of heat is in specific terms. Heat is something a human "feels." Humans do not feel absolute temperature. They feel thermal energy entering or leaving the body. To humans, "heat" is a flow of energy, not simply the energy itself. When one object heats another, it does so by thermal energy flowing from the hotter to the colder. Luke: "Obi Wan, I need the Force to FLOW through me!" Obi Wan Kenobi: "No Luke, you need thermal energy to flow through you. You look like you need some serious heat." James___ wrote: I know I'd like to understand what they mean. James___ wrote: Instead of them demeaning others maybe they can offer a clear and concise definition of what heat is? Is that too much to ask? I have given you the physics basis for understanding "heat" as well as the Global Warming obfuscation taken directly from the Manual. You should be an expert now. James___ wrote: IBDaMann, yours or ITN's standard reply is meaningless. The only reason an element or a molecule releases heat is because it interacts with something else. I don't know what you mean by "releases." No substance "traps" heat. All matter radiates per Stefan-Boltzmann. All matter, always, everywhere. This means that even single atoms radiate and that means that even single atoms passively lose thermal energy. Yes, contact with another atom/molecule is required for conduction. James___ wrote: Why does a black body have energy to emit? Neither you nor ITN can answer that question. James___ wrote: I think the real question is what you and ITN have against people. I just hate them all. What? You think Marxists are the only ones capable of hating all of humanity? I'll give them a run for their money. It is the flow of thermal energy. That is the standard definition. If someone knows that it really means nothing. After all, in our atmosphere of which we can't measure the temperature according to Into The Night and IBDaMann, we simply can't know if the Stefan-Boltzmann constant means anything. You complain about others demeaning you, then you turn right around and demean them. It's a two-way street, dude. Well answered. Very complete. Yes, he's been told it's chemistry before. One way I like to describe heat is like a current in a river. It is the flow of the river that moves water from place to place, not the water itself. Nice copy and paste. It might help you to learn something. And for the sake of argument I will agree with you. When a CO2 molecule is 310° F. leaving the smoke stack of a coal fired power plant, heat occurs when it transfers energy to atmospheric gases like you showed. Thank you for showing that the process of transferring kinetic energy from one molecule to another allows for heat. 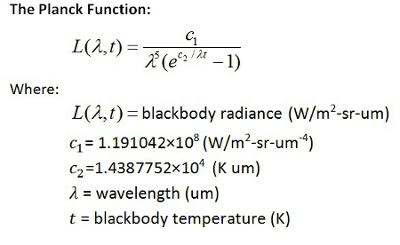 As for what you explained about black body radiation, once again you failed to show a source of energy. What you don't understand is that this work of Planck's was accomplished before there was electricity from a generator. He had steel bars heated in a blast furnace. This is why it says what it absorbs then emits. It's the surface reacting to the field it's in. It's also this constant h which allowed for Einstein to consider Relativity. See what happens when someone takes time to read books? They'll contain information that's hard to find on the internet. James___ wrote: Nice copy and paste. I think Al Gore invented the concept. James___ wrote: Thank you for showing that the process of transferring kinetic energy from one molecule to another allows for heat. I don't know what you believe you mean by this wording here. Like it says in The MANUAL, warmizombies like you use the word "heat" to allow you to babble and gibber without technically being incorrect. If you are thanking me for showing that kinetic energy does not prohibit the flow of thermal energy, well, I don't think anybody anywhere had any doubts about that. It seems like your definition of heat is limited by your ignorance. You need everything in simple terms because that's all you understand. What your kind shows is that you don't find science interesting. You pretty much claim that the Earth doesn't have any warm or cold periods because you don't have a definition of warm or cold because what are they really? Like when you take a shower, it's not warm or hot but merely "is". That's how simplistic your reasoning is and that's getting into spirituality which is not a religion because it "is". That's all you and ITN keep promoting, your own non-religious beliefs. BTW, ask ITN to say we can't pollute our planet. It's not possible. I know he can't say that. His non-religious beliefs won't let him. BTW, when you said "Q/t = kA(T2 - T1)/d you agreed with what I've been saying for a long time. 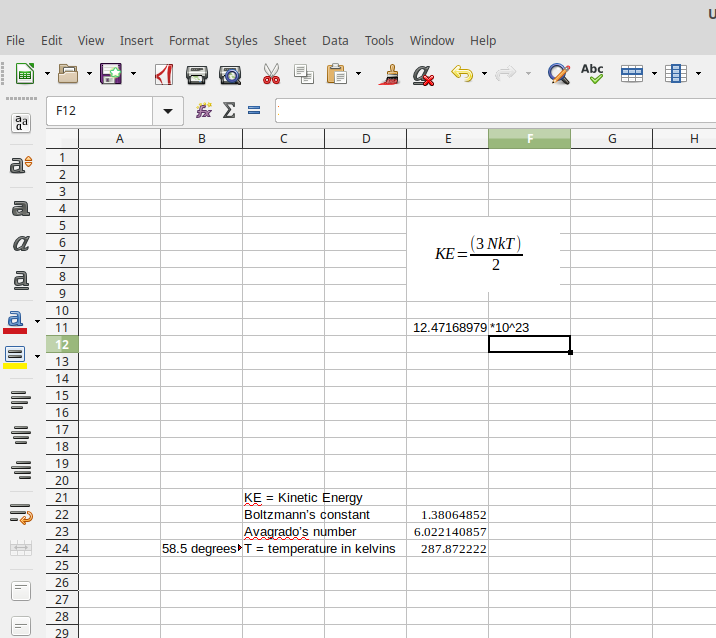 That KE = 3/2kT2 - 3/2kT1 = KE as a flow of heat in which energy is CONSERVED. ITN says this doesn't happen. That atmospheric gases cannot store heat as KE. You said it happens. That's why I was thanking you so once again, Thank You IBDaMann for saying what I've been saying is correct. [quote]James___ wrote: Nice copy and paste. It seems like your definition of heat is limited by your ignorance. You need everything in simple terms because that's all you understand. What your kind shows is that you don't find science interesting. You pretty much claim that the Earth doesn't have any warm or cold periods because you don't have a definition of warm or cold because what are they really? He never said that, and neither do I. Quit lying James. Warm and cold is just relative differences in temperature. Like when you take a shower, it's not warm or hot but merely "is". That's how simplistic your reasoning is and that's getting into spirituality which is not a religion because it "is". It's warm or hot because of your own perception. That's all. That's all you and ITN keep promoting, your own non-religious beliefs. You call it a religion then call it a non-religion? Now you are locked in paradox. BTW, science is not a religion. Again you are lying. I've already said otherwise. Heat is not conserved. You are using the wrong equation for heat. Use the one IBDaMann provided. Heat is not contained in anything. ITN says this doesn't happen. That's right. You still don't know what heat is. That atmospheric gases cannot store heat as KE. That's right. You cannot store heat. He never did. You are lying again. That's why I was thanking you so once again, Thank You IBDaMann for saying what I've been saying is correct. Putting words in peoples mouths is just lying, dude. When something causes the skin to burn or blister, that is a physical event. Even sweat is a symptom of increased warmth but you've probably have never been active or anywhere where it's warm enough to cause you to perspire. Your answer suggests you live inside of a room where everything is always the same and nothing ever changes. Or you're simply ignoring reality. People get sick because they go out into the cold if they don't wear sufficient clothing. Not perception but different temperatures allow for different things. Yet you want to argue over the definitions of words while their definitions mean nothing to you. You keep promoting spirituality while this is not a spiritual forum. A person with any kind of sense would know they are in the wrong place but you think that if you don't perceive something then it doesn't exist. This is where you are limited by your ignorance. Sadly you probably have a lot of problems and rather than do something about them, you feel better about yourself by being an a$$hole. If you were white then you'd be a redneck. This is your life and all that it has come to. That's sad and I feel sorry for you but I have my own life to live. Into the Night wroteIt's warm or hot because of your own perception. That's all. When something causes the skin to burn or blister, that is a physical event. True. It may or may not have something to do with temperature. Ever hear of poison ivy? Even sweat is a symptom of increased warmth but you've probably have never been active or anywhere where it's warm enough to cause you to perspire. Sure I have. It gets hot in Seattle sometimes. Your answer suggests you live inside of a room where everything is always the same and nothing ever changes. Or you're simply ignoring reality. Define 'reality'. Bet you can't answer that one either. BTW, you've been in that hole before too. People get sick because they go out into the cold if they don't wear sufficient clothing. So? Nothing to do with heat. Not perception but different temperatures allow for different things. Again, nothing to do with heat. It is YOU that is arguing over the definitions of words. Inversion fallacy. while their definitions mean nothing to you. You are lying again. The definition of heat has been given to you my multiple people. You just deny science. You keep promoting spirituality while this is not a spiritual forum. Non-sequitur fallacy. There is no such discussion going on here. You are lying again. A person with any kind of sense would know they are in the wrong place but you think that if you don't perceive something then it doesn't exist. This is where you are limited by your ignorance. Sadly you probably have a lot of problems and rather than do something about them, you feel better about yourself by being an a$$hole. Inversion fallacy. You are describing yourself. If you were white then you'd be a redneck. You don't like rednecks? You hate them too? This is your life and all that it has come to. That's sad and I feel sorry for you but I have my own life to live. You are describing yourself again. As you can see, those two are so far out in left field that they don't know what is happening and will argue for no particular reason. As you noted Nightmare thinks that a gas cannot hold "heat" DESPITE all of his speeches about the Stefan-Boltzmann law which says that heat can be either KE conducted molecule to molecule or via radiative energy. Over half of the energy escapes the Earth via conduction into the ionosphere which then is turned to radiation in a complex manner with incoming energy from the Sun. They usually refer to this as reflection and indeed some of it is. But over half of it is not - it is radiation from KE conducted from molecule and raised by conduction into the upper stratosphere. The rest radiates from the ground or oceans in the low IR bands. So heat is KE but it can be transferred in two manners - direct radiation or conduction and convection. Heat can be transferred 3 different ways, conduction, convection and radiation. Nothing new there yet you listed them as 2 ways. They do teach that in school. What you'll miss is that multiplying a value that's more than 0 and less than 1 always end up being division. With what I did, I left both Avagrado's number and Boltzmann's constant as more than 1. What everyone else would do is square the 23rd power. Yet the total energy should be higher than Avagrado's number because when they are both to the 23rd power, the total energy should go up. So if I am right about this then that would be a new understanding in mathematics. This is where I have things I'm actually working on while you guys just try to make someone look bad. 10^-23 cancels out 10^23 so the correct answer in J/k does not include 10^23 as I wrongly showed. The 12.xxxx is how many joules per Kelvin or 1° C. in 1 mol of gases. That'd be the right answer. The size of gaseous molecules varies. 1 mol has a volume of 22.4 liters of ANY ideal Gas. Just not possible. I mol of CO2 or even O2 would occupy more space than N2. If they don't know how much space of each gas occupies then they can't say how it influences our environment. This is something basic that scientists should've already demonstrated but haven't. Conduction and convection are the same thing. From the transference of heat via conduction it causes warmer air to rise. Convection is something of the opposite. The rising warmer air is displaced by falling cooler air. Though of course it is a great deal more complicated than that. I'm not quite following what you think that your conversions mean. Conduction and convection are 2 different things. Conduction happens when heating or cooling happens when 2 things are touching each other. Convection is one thing flowing into or through something. My conversions shows how easy it would be in accordance with physics to do physical testing to determine how the composition of gases influences the amount of heat our atmosphere can store. Such testing hasn't happened. That's why there's a debate instead. Wake, when water in an electric hot water heater is heated by the heating element, that is conduction because water is touching it. When the heated water moves away from the heating element then convection is happening because a flow of water is heating cooler water. And as the heated water is flowing away from the heating element, it will mix with cooler water. (1030) To simplify, if you have 120 volts x 10 amps then you have 1,200 watts. If a heat lamp will convert that into heat, hence the name. If the emission of the heat lamp is tested then it's efficiency will become known. Then if a container with a volume of 10 mols, ie., 224 litres, and if room temperature is 74º F. or 23.33º C., it would take 623.5 watts for 1 second to raise the temperature in the container by 9º F. or 5º C.
Then how long does it take to cool down to room temperature? If CO2 levels are increased or decreased, how does this influence how long it takes the gases in the container in the room to cool down to room temperature? If CO2 has any meaningful influence on heat retention then entropy would decrease. And the greater the difference between room temperature and the temperature in a container, the more entropy that will be suffered, ie., easier to observe. With me, I've said it before, the debate over what CO2 does or doesn't do takes away from more important issues. To simplify, if you have 120 volts x 10 amps then you have 1,200 watts. If a heat lamp will convert that into heat, hence the name. If the emission of the heat lamp is tested then it's efficiency will become known. Sounds like a fun, and pointless demonstration, since you could play with several things to effect the results, and still not be the same as being outdoors, or simulate a natural environment. Outside the lab, you have wind, humidity, and a few other things going on, that will effect the outcome. There is still so little CO2, and the temperature variance is small, with a very large margin of error. You could make any claim you want, and it would still fit. Climatology only looks at the part that works for them, and ignores tolerances, margin of error, precision. They don't tell the full story, just the convenient parts, which is politics, not science. Wake wrote:As you can see, those two are so far out in left field that they don't know what is happening and will argue for no particular reason. Wake, of which two are you referring? Am I one of them or are you referring to James__? If I am one of the included, would you mind taking a look at my post and telling me what, exactly, is inaccurate and "so far out in left field" so I can rush to fix it? Wake wrote: As you noted Nightmare thinks that a gas cannot hold "heat" DESPITE all of his speeches about the Stefan-Boltzmann law which says that heat can be either KE conducted molecule to molecule or via radiative energy. That's not his position. Why the sudden need to pretend to speak for others? I don't recall Into the Night asking you to be his spokesperson, probably because he can speak for himself and because you can't get his position correct. Next time, don't tell us what you believe his position is; copy-paste the text directly, with all context, and let him speak for himself. Nothing screams "I am a moron and I'm totally wrong" like having to resort to misstating the positions of others. If it is moving into the ionosphere, it isn't escaping earth now is it? Wake wrote: The rest radiates from the ground or oceans in the low IR bands. Wake wrote: So heat is KE but it can be transferred in two manners - direct radiation or conduction and convection. Energy can take different forms. I hope I'm not the first person to tell you that different forms of energy are not the same form of energy. Different forms of energy are specifically different. One form of energy is kinetic energy. Another form of energy is thermal energy. Thermal energy is not kinetic energy. Kinetic energy is not thermal energy. They are different forms of energy. Conduction is the flow of thermal energy, not of kinetic energy, from a molecule of higher temperature to a molecule of lower temperature. Do you remember who it was that told you "heat is KE but it can be transferred in two manners - direct radiation or conduction and convection"? Whoever it was, I'm betting that you were bent over a table at the time. Imagine, kinetic energy being transferred via radiation! Too funny! Wake, I suppose I am going to be the first person to tell you this but conduction is the flow of thermal energy. 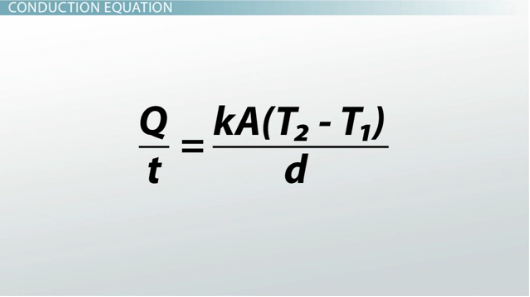 If you don't believe me, look at the equation. And it is not kinetic energy that is flowing; there is no change in momentum. So if you are saying that "heat" is just the thermal energy and not the flow thereof, and that "heat" is kinetic energy then you are under one serious misconception that kinetic energy is thermal energy and vice vesa. You are gullible ... and scientifically illiterate. James___ wrote: Heat can be transferred 3 different ways, conduction, convection and radiation. All you are telling anyone is that you don't know what form of energy you are even talking about in any given situation, so you apparently fall back on using the word "heat" to disguise your cluelessness. Wake is correct. Convection is merely the conduction that occurs in flowing fluids. Both describe the flow of thermal energy from higher temperatures to lower temperatures. Radiation is not the flow of thermal energy. Radiation is a transfer of energy, specifically of electromagnetic energy which is not thermal energy, so I don't see how it can be a transfer of "heat" unless you are using the warmizombie's fluidly-shifting definition of "heat" to mean whatever you need it to mean at the moment. James___ wrote: What you'll miss is that multiplying a value that's more than 0 and less than 1 always end up being division. Did you know that dividing by a value that's more than 0 and less than 1 always end up being a multiplication? James___ wrote: With what I did, I left both Avagrado's number and Boltzmann's constant as more than 1. What everyone else would do is square the 23rd power. Yet the total energy should be higher than Avagrado's number because when they are both to the 23rd power, the total energy should go up. If you are correct, it would be a new understanding in science, not in math. p.s. - have you tried applying the scientific method yet? If yes, in what way? Thanks with the luck part. You should read my entire post. I said I made a mistake when considering 10^23 and 10^-23. With how I factored it, it was at 1 atmosphere. With 3NkT/2, that's at 1.5 atmospheres. I have another project that I'm working on at the moment. If that works then it would give me a chance to ask about the test. What you might not understand is that there's a chance it hasn't been done because scientists are concerned that it might not give them the answer that they want. That is a possibility because at the same time it could prove what they claim. And if done publicly, it would be difficult to falsify the test results because it wouldn't involve only one group of scientists that share the same belief. One tenet of science is repeatability. And with a test like that, I'd think that even skeptics and various scientists would try it. This is one reason why there's an issue with about all climate models, try replicating the results and they'll differ. James - you are talking silly. If you look up the definitions of conduction and convection they are running around in circles. Direct contact with a heated surface is called conduction. But then they will defined the transfer of heat between air molecules through direct contact convection. It is the same thing and they are simply playing with the states of the matter; i.e. why should you call it conduction if water is turned to steam - liquid phase to gaseous phase. But then a gas being heated by contact with other gas molecules called convection. It is a childish definition. Warmed air rises while expanding. It displaces the cooler, higher density (heavier) air. While rising it is also pushing the molecules further apart making it pass heat more slowly. It can only rise to the level at which the rest of the air is the same temperature. Remember that as air expands it also cools. The whole damn thing gets extremely complicated and all you have to do is look at the temperature profiles of the air through the different layers of atmosphere to see just how complex it does get. And it is CONDUCTION of heat that triggers it all. Playing games with the definitions of words doesn't change that fact. Also I have yet to see what the hell you're getting at with the idea of heating a gas in a jar and then seeing how long it takes to cool down. That has nothing whatsoever to do with the composition of gas within the bottle. It is far more reliant upon the conduction surface of the container, the temperature of the gas and the density of the gas outside of the container. The specific heat of the gas within the container will rule how much energy it takes to reach a certain temperature. But at the same time there will be a constant energy loss to atmospheric conduction from the container so the whole damn thing doesn't prove anything. And as Harvey says - it has nothing whatsoever to do with the real world. All that we can be sure of is that the total density of the atmosphere is the only important thing in the insolation factor that forces the Earth to raise to a certain MGT to achieve a balance of energy in to energy out. This insolation factor is so important that it totally rules everything else. The other factors are the actual solar constant which causes the emission upon the planets. (1030) Wake, convection and conduction are 2 different things. This is because they use different processes. Have you thought about going to school for engineering? It might help. You contradicted yourself. This insolation factor is so important that it totally rules everything else. Also I have yet to see what the hell you're getting at with the idea of heating a gas in a jar and then seeing how long it takes to cool down. That has nothing whatsoever to do with the composition of gas within the bottle. A contradiction. Whether gases are in the atmosphere or in a jar they will exhibit the same properties. If they can absorb and retain heat in the atmosphere then they will also do the same in a jar. With a jar we can see whether or not the rate of entropy changes. Radiation can indeed be the flow of thermal energy, though not directly. Radiant heat is one form of heating. It is heat if and only if the radiance is absorbed by another substance. Light that is not absorbed is not heat. Light itself is electromagnetic energy, not thermal energy, but light can also be heat. Obviously one cannot contain light any more than one can trap heat. Your equation has nothing to do with heat. Heat is not thermal energy. James - you are talking silly. If you look up the definitions of conduction and convection they are running around in circles. No, the definitions of each are quite clear, Wake. Direct contact with a heated surface is called conduction. But then they will defined the transfer of heat between air molecules through direct contact convection. No one does, Wake. Convective heating has nothing to do with conductive heating. It is the same thing and they are simply playing with the states of the matter; i.e. why should you call it conduction if water is turned to steam - liquid phase to gaseous phase. But then a gas being heated by contact with other gas molecules called convection. It is a childish definition. Strawman fallacy. The state of matter or whether it changes is irrelevant. WRONG. Rising warm air rises BECAUSE of cooler, higher density air around it. It does displace that air at all. The only part you have correct is that air is cooled by convection due to it's expansion into lower pressure. Convection also concerns falling air, which becomes warmer as it falls. Not at all. Temperature profile doesn't matter. Energy profile DOES. It continually decreases with altitude, despite temperature inversions in the atmosphere. and all you have to do is look at the temperature profiles of the air through the different layers of atmosphere to see just how complex it does get. Nope. You are looking at the wrong thing. Remember, temperature is the average kinetic energy of molecules. Just because there are fewer molecules makes NO DIFFERENCE. Energy, however, is less BECAUSE there are fewer molecules. And it is CONDUCTION of heat that triggers it all. WRONG. It is radiant heating from the Sun that triggers it all. Playing games with the definitions of words doesn't change that fact. Your facts are wrong, Wake. No word games. WRONG. It has a lot to do with the composition of gas in the bottle. Different gases have different heat index values. Some are easier to warm than others using the same energy or time. It is far more reliant upon the conduction surface of the container, the temperature of the gas and the density of the gas outside of the container. Which does nothing about the heat index of the gas inside the bottle. The specific heat of the gas within the container will rule how much energy it takes to reach a certain temperature. This is correct, but now you are contradicting yourself. But at the same time there will be a constant energy loss to atmospheric conduction from the container so the whole damn thing doesn't prove anything. Supporting evidence is not a proof. Science has no proofs, so you are correct that the whole thing doesn't prove anything. And as Harvey says - it has nothing whatsoever to do with the real world. Glass jars with gas inside IS part of the real world, Wake. All that we can be sure of is that the total density of the atmosphere is the important thing in the insolation factor that forces the Earth to raise to a certain MGT to achieve a balance of energy in to energy out. WRONG. Makes no difference. You are ignoring Kirchoff's law again. The energy of Earth or any other planet is taken as a whole, not as pieces and parts. Each piece and part MUST add up to the whole, and the whole is the only thing considered. You cannot move the goalposts this way. WRONG. Planets also have their own internal source of energy. The fission reactions at Earth's core, for example. Wake, convection and conduction are 2 different things. This is because they use different processes. It is not possible to absorb or retain heat. Heat is either there, or it isn't. I know who you remind me of. Barney Fife on Mayberry RFD. Andy said that Barney reminded him of a little kid. That's why he got such a laugh out of him. Into the Night wrote:Radiation can indeed be the flow of thermal energy, though not directly. It is this point that really convolutes the semantics. For the entirety of its existence, electromagnetic radiation is only that, i.e. electromagnetic radiation. All you can say about electromagnetic radiation is that it is energy, in the form of electromagnetic energy, moving at the speed of light. If it is moving through space and will not be incident to any matter (i.e. it will not be absorbed) then no one can call it "heat being transferred." Of course, the act of absorption destroys the electromagnetic nature of the energy. Ergo, electromagnetic radiation cannot be said to be any more than the transfer of electromagnetic energy from point A to point B. Having said that, I understand exactly what you are trying to say. I merely claim that we need to use different words. I am not saying that the underlying idea needs to change ... just the words. Where you write: "Radiation can indeed be the flow of thermal energy, though not directly." I claim should be written "Thermal energy is transferred via the emission and absorption of electromagnetic radiation ... or via conduction through physical contact with other matter." The difference here is that the transfer is not the electromagnetic radiation, but rather is the emission and absorption thereof. Yes, yes, ... you think I'm nitpicking unnecessarily but this topic is the most misused (often intentionally) for political malfeasance and I find that if I toe the stricter semantic line then I can better express why the BS is what it is. Once again, you are not incorrect in your understanding. In a forum of ideas, words are all we have. Into the Night wrote: Radiant heat is one form of heating. I object to this wording, although I'm not inclined to quibble with you because I know what you are trying to express and your understanding does not need correcting. If I were giving a lecture, I would say that no, there can be no such thing as "radiant heat" if you are defining "heat" as "conduction." I would add that I would summarily dismiss any argument from anyone who uses the word "heat" if he or she has not specified what he or she means by it. Unless one equates "heat" with "conduction" then the word "heat" is not to be found in science. It is found in the dictionary, and the dictionary is not a physics textbook. Conduction is the flow of thermal energy ... by physical contact. Otherwise, the electromagnetic radiation is covered under black body science, and I know you understand all that. I get uppity when people like James__ conflate those two, and then includes other concepts into the conflation, along with some violations of physics, resulting in more of a sci-fi script than an argument. Words. I'd like to thank whoever invented them. They're pretty powerful. Just remember to use them for good, and not for evil. Unfortunately, words in general in the English language are often quite lacking. Most languages have this problem to one degree or another. I consider 'radiant heating' a valid term. It describes the transfer of thermal energy by emission and absorption of electromagnetic energy. Heck, Earth would be a lot colder without it! Any description of the methods of heating must include radiant heating as well as convective heating and conductive heating. The basic problem that James has is the notion that heat is temperature. It's not. Heat has no temperature. This is true of anyone using 'heat' as defined in The Manual. They mistakenly connect temperature with heat. James is also confused about the term 'specific heat'. This is understandable because of his notion about heat being so wrong. I consider this concept in physics one of the worst named there is. It causes a LOT of confusion. It is the reason that people still don't really know why the cooling system in their car is designed the way it is. Are you saying you don't want an education? Very well, remain illiterate. Into the Night wrote: I consider 'radiant heating' a valid term. It describes the transfer of thermal energy by emission and absorption of electromagnetic energy. Heck, Earth would be a lot colder without it! In a forum of ideas, you are participating correctly and honestly. You are defining your terms. It doesn't matter what terms I prefer or anyone else for that matter. It doesn't matter what Wikipedia says or any other website. You assert that by 'radiant heat' you mean thermal energy that transfers from one (hotter) body to another (colder) body by way of emission and absorption of electromagnetic radiation (covered under black body science). Great! You have done everyone a favor by eliminating the need for you to write all that every time, and for everyone to read all that every time. You just write "radiant heat" and everyone else merely checks to make sure your are correct in your application of the term in each case. Voila! Well done. Of course, you must allow leeway for those who missed your definition or who entered the discussion late who might say "Hey, there is no such thing as 'radiant heat'" at which point you might have to reclarify what you mean by the term. In a situation like that, no one is wrong, it's just a miscommunication, but those never really ever happen. Into the Night wrote: James is also confused about the term 'specific heat'. I would put this in The MANUAL if I could just get James__ or any other warmizombie to tell me what he believes this term means. As it stands, none will commit to an answer because they are all keenly aware of their own scientific illiteracy and that they are merely parroting whatever Wikipedia tells them to regurgitate. Anyway, there is no such thing as a substance that is "filled to capacity with 'heat' and can no longer increase in temperature." There is such a thing as thermal equilibrium in which a body will no longer increase in temperature ... but that does not differ between substances, i.e. it is only based on temperature. There is no such thing as different substances having different thermal equilibrium temperature points ... if that's even possible to express. I think warmizombies are completely aware that they are spewing gibberish but they always end up blaming me for it ... or you ... or anyone bringing actual science to the discussion. Into the Night wrote: It is the reason that people still don't really know why the cooling system in their car is designed the way it is. I'm going to come clean. I don't know what the engineer was thinking when he designed my car's cooling system so I don't know the REAL reason it was designed that way. All I know is that I call it my "climate control" system ... but because it works no matter where my car is on earth, it is the global climate system. I tell people that it works via a thermal forcing and it's driven by feedbacks (without going into the technical specifics). ITN, your's and NotDaMann's teachings is what led to communism in Russia. Tell you what - I worked for 40 years as an engineer. I worked on projects in which I designed the machine that identified HIV and connected it to AIDS. That gained the chemist that used it a Nobel Prize in Chemistry. I designed and programmed machines that identified and even treated some types of cancer. I built robotics and artificial intelligence. I even designed and programmed some of the communications boards that are on the International Space Station. Please tell me what you have done besides played with the other kids in the sandbox. "rate of entropy changes"??? You haven't a clue what that means do you? Again, tell us all what you have ever done in your entire life. Do you know what's funny Wake? You don't even know what you said in your comment that I quoted. HAHAHAHAHAHAHAHAHA! You really ARE wacked out! None of us were alive when communism reached Russia! The Church of Global Warming seems to use the term 'specific heat' as a synonym for 'heat'. Like their definition of 'heat', it is always changing, it also has a temperature (when it really doesn't), and it acts as 'proof' that 'heat' is a content, which supports 'heat' as defined in The Manual. So according to the Church of Global Warming, 'specific heat' has the same meaning as 'heat'. If you look back through James' posts as examples, you will see that is how he is using it. Tell you what - I worked for 40 years as an engineer. I don't believe you, Wake. You have already demonstrated your lack of engineering expertise many times. I worked on projects in which I designed the machine that identified HIV and connected it to AIDS. Doesn't take a machine to do that, Wake. That gained the chemist that used it a Nobel Prize in Chemistry. Chemistry is not involved in that, Wake. The Nobel prize in Physiology and Biology for the discovery of the HIV virus went to a couple of Frenchmen. When were you in Paris, Wake? Stop claiming the success of others as your own. I designed and programmed machines that identified and even treated some types of cancer. I built robotics and artificial intelligence. I even designed and programmed some of the communications boards that are on the International Space Station. I don't believe you. You know almost nothing about electronics as already demonstrated. Guess what, Wake? It doesn't matter! No, he doesn't. Then, neither do you. James___ wrote: Wake, convection and conduction are 2 different things. This is because they use different processes. James__, you are a moron. Convection is the conduction that simply occurs in fluids. Wake is correct. Conduction is simply the flow of thermal energy via physical contact, from matter of higher temperature to matter of lower temperature. That matter doesn't have to be a solid. It can be a fluid. It's just that when conduction occurs in a fluid, as the cooler fluid increases in temperature, it expands and thus moves. You can verify this for yourself. The formula for convection is the formula for conduction without "d" (thickness) since that obviously does not apply to fluids that are mixed. James___ wrote: Have you thought about going to school for engineering? It might help. You contradicted yourself. You are quick to throw stones considering you know nothing. You obviously didn't even bother to look up the formulas that would have answered your question. You apparently won't perform even a modicum of independent research if you think it might put your gross misunderstanding in jeopardy. Why haven't you told us what you've done with your life? Where you believe you got any expertise in anything? More accurately it isn't "the flow" of energy but the amount of energy per cubic unit of matter. James, you are doing things like Nightmare who somehow trips across a term and thinks that is the answer to God, the Universe and Everything. You have to take a far more wider view. There is NOTHING simple about the universe. I don't even believe that they recently took a "picture" of a black hole. At its distance using telescopes on opposite sides of the earth I do not believe that to be a wide enough base to be a real picture. This could just as well be light from a more distant star being bent into that "donut" shape from the gravity field of an intervening star. I would expect them to need a simultaneous picture from opposite sides of the Earth's orbit. Like your measuring of "entropy" with your bottle of CO2 experiment that was nothing of the sort. You seem bright enough to learn but not if you're not bright enough to actually want to learn.